Allows you to produce hundreds of different patterns and textures on pens in countless combinations - including polygonal barrels with as many as twenty-four flats. Raises the art of pen turning to a new level! The Pen Wizard is a stand-alone ornamental lathe especially developed to create novel and interesting patterns on pens and pencils. We have "tweaked" this new version of it slightly: we now assemble it in reverse order so that you can more easily see what you are doing. Otherwise, the Complete Pen Wizard 2 is identical to the first Pen Wizard. It is capable of producing hundreds of different patterns and textures, including plain polygonal barrels with as many as twenty-four flats. Normally used in conjunction with a standard lathe, it can also follow simple patterns of concave & convex curves. 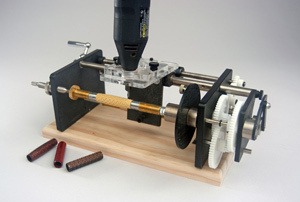 It requires a rotary cutting tool such as a Dremel™ or Foredom™ and standard pen mandrels with 1/4"-28 threaded rods. Accompanying it are complete instructions and a DVD explaining its use, as well as offering basic pen making tips. The Pen Wizard was designed by J.R. Beall and is assembled here in Ohio by the Beall Tool Company. With the exception of only a few small standard components, it is made in the U.S.A. Metal parts are mostly of steel, nickel plated to prevent rusting; plastic parts are of Delrin™, acrylic or PDE which has been accurately machined by CNC lasers or routers. Though the Pen Wizard has been tested extensively during the several years it has been in development, we believe that only a fraction of its potential has been explored. We expect that you will investigate, refine and expand its possibilities and share your findings with the world. . .
For a video showing the Pen Wizard in operation, please watch our videos on YouTube. We also have cutting bits and other accessories for the Pen Wizard.